Australian Feral Management are continually researching new systems to control this feral bird which is now ranked in the top 100 most invasive species. 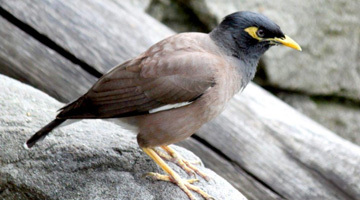 The Indian Mynah, bully of the bird world (also known as the Common mynah, Common myna, Indian myna) has earned the reputation of being one of the worst feral animals in Australia. It’s likely that if you live in Sydney, Melbourne, north Queensland or Brisbane, you’re already familiar with them. starling family and comes from India. Mynahs carry bird mites and have the potential to carry avian-borne diseases that are dangerous to people, not to mention the huge amount of droppings they leave under their communal roosting trees. Often gathering at night in numbers in excess of a thousand, these raucous birds can take over clumps of trees, especially around areas where lots of people go (where they encounter fewer predators) like shopping centres. In a short time their droppings can cover 100% of the ground and public seating under the trees.